It is the end of Day #6 and this has been the most eventful one we’ve so far had in our Antarctica trip. This is not an ordinary journey and there is very little you can plan in advance. You are by now familiar with the reason of our trip to this remote location: to participate in the first ever Ice Swimming competition in the continent, among some of the world’s best ice swimmers, and to conclude in this way the Continents Seven project I have been pursuing throughout 2018. Our ship was originally planned to depart from Ushuaia – Argentina on Nov 6, so that we could swim a week later, but some engine problems made us change the whole itinerary and we departed from Punta Arenas – Chile instead, on Nov 16. 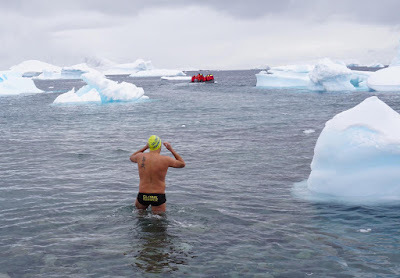 The race director and IISA president, Ram Barkai, was the third person to ever swim in Antarctica and the mind behind the race, certainly not an easy one to organize. Ice swimmers from South Africa (4), Argentina (2), Russia (2), Australia, Bulgaria, China, Italy, Poland and Spain, along with their support teams. Days #1 to #3 were lost in the Drake Passage, or Drake Shake as we came to call it after that. Waves of 8 meters and a tough journey that leaves you exhausted and sick. When we woke up on Day #4 all we wanted to do was to get out of the ship and stretch our legs, but a huge storm of 35 knots winds and loads of snow was waiting for us in Livingstone Island. No problems – we gathered Monday night and prepared the logistics for a test swim the day after – a 200-meter swim in the -1C waters, just to remind our brain and body what should expect in the Ice KM. However, Day #5 stayed pretty much the same and all we got to do was a zodiac cruise around huge ice blocks – which did nothing but make us more anxious. On the bright side, I spent that afternoon getting to know better an OWS living legend, 4-time Olympian Peter Stoychev, whose humility makes him an even greater athlete. The different languages and backgrounds have not been an impediment, and the whole group has stayed together against weather calamities. I started Day #6 like any other, going for an (indoor) run at 6am and waiting for the captain announcement on the ship’s speakers. “Conditions have improved, there are loads of penguins waiting for us ashore and ice swimmers will carry out their test swim” – WOOHOO! The whole boat was ecstatic for either watching penguins or for swimming in -1C waters – weird people we are. So we finally touched Antarctica’s land and wandered among penguins for over an hour. At about 11am we were called to “the beach” to do our practice. We would simulate the same heats as the race day, and a course of about 200 meters between two zodiacs, finishing by climbing on top of the zodiac. Heats 1 to 3 finished up quickly and it was my turn. I had been helping in the recovery of other swimmers, so I am the last one to leave. Surprisingly, the emotion takes over and I don’t feel the pain when I get in, I am super focused and enjoying it. I avoid some icebergs here and there; I touch the mid-point and turn. I start focusing on my arms, trying to swim well and not to lose sensitivity, but it is hard, my hands start going numb. It goes very quickly, and I climb the zodiac with some help. I jump again into the water, and finish the swim by the shore. As usual, an ice swim does not finish until one recovers and my hands made this one longer than usual. But it is all good, and we are all super happy to have done it. During dinner, we have just discussed the way forward and it does not seem that tomorrow, Thursday 22nd will be a good day for the Ice KM due to currents, so we will probably have to wait until the weekend. The ship will have to start its way back to Ushuaia on Sunday night, so we are really hoping for good conditions either Friday 23rd or Saturday 24th and for being able to complete the Ice KM then. We came here to make history, and so shall we. Stay tuned.